Headset Insights is a tool for businesses that delivers market trends based on aggregated sales data collected from retailers and dispensaries in real-time, so operators can better understand the competitive landscape, know their brands’ position in the market, and even identify opportunities for future product development. 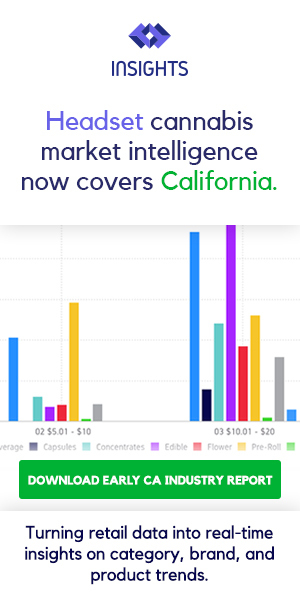 As the birthplace of cannabis legalization initiatives in 1996, the forecasted size of the California market is expected to swell to $5.6 billion by 2020, marking it the largest in the United States, with all four of its major metropolitan markets currently online with legal cannabis production, testing and retail outlets. The number of retail licenses grew by 113% during the first six months of 2018, proving that there will be no shortage of outlets available to the adult use consumer. As of July 1, stringent new regulations on testing, packaging, and labeling have gone into effect in California, securing the positions of the industry’s most serious players. There has never been more need for big data products and services. The cannabis industry is moving rapidly, and operators are looking to use data analytics to identify the fastest-moving product segments and consumer demographics before their competitors do. Unlike other software tools, Headset collects this data in real time, directly from the industry’s top POS systems, and reports back to operators to guide their most crucial business decisions. Cannabis operators and other industry players can run analytics on cannabis products at the SKU, brand and category level, gaining key insights into where they rank within the overall market. Headset’s market data illustrates how manufacturers stack up next to the competition and is invaluable for brand positioning when approaching new or existing clients. Real-time analytics are important, as the state regulations continue to change, and new licenses continue to roll out, creating even more competition. With Headset Insights real-time data, operators can find out what is happening in the market right away and make timely business decisions. 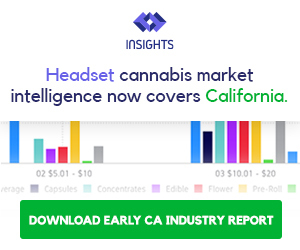 For information about the California cannabis market, read Headset’s Early Market Trends: California 2018 industry report. To track the best selling brands, visit Headset Best Seller List, updated daily. For more information on Headset and its services in California, visit Headset.io.